How to Wash Ski Gloves? How to Dry Ski Gloves Effectively? How to Attach Ski Gloves to Jacket? Where to Buy Ski Gloves Online? Many people don’t usually associate skiing with ski gloves, usually when you mention the word ‘skiing’, people will think of ski helmets, skis, socks, thick coats, warm ski pants and tough boots. While all of those pieces of gear are vital to have if you want to survive out in the cold wilderness, the best ski gloves are essential to have. Snowboarder? Check out our review on Snowboarding Gloves. Your hands will be exposed to the cold elements for long periods of time and it’s extremely important to cover them. Your finger tips are especially prone to the cold and people who don’t wear ski gloves usually experience blue or purple fingertips. This is due to the lack of oxygen in the fingers due to the cutting cold, which is dangerous especially when your palms are locked in a tight grip. Gloves will not only help keep your hands warm, but they will also give you much more comfort than if you weren’t wearing them.There are hundreds of choices out in the world today to pick from if you are looking for a good and durable set of ski gloves, but that also means that it may be hard to choose a pair that suits you specifically. If you don’t know a lot about ski gloves, we hope that we can help expand your knowledge and help you choose and good pair of gloves from our list. We hope that both the reviews and the FAQ section will prove to be useful in making a good, solid decision! P.s. Don’t forget your Ski Mask – click here. Whenever someone says the keyword “mitten”, people usually associate it with a knitted pair of mittens that you would give to a toddler on a particularly frosty morning. While that scenario is definitely prevalent in the world today, mittens can also be meant for adults! Mittens, like the ones we have here from Outdoor Research, are a fantastic choice if you don’t like to fiddle with trying to put all your fingers into the finger holes. One of the best features of these mittens is that they are breathable, that ensures that you will get some airflow coming through so that your hands won’t get sweaty and slippery and make your riding difficult. Unlike many other pairs of ski gloves, these are eligible to be washed in a washing machine, which is a great convenience, especially for people that are tired of hand-washing their old ski gloves. These mittens won’t weigh you down since they are made of a very light-weight material, they have 3 layers of material stacked up and have a modern, boxy construction with a slick curve. This design will help keep all of your fingers warm thanks to the heat they will be insulating when being stacked together, unlike you would get in a usual glove. The material these are made from is definitely top notch and customers are often surprised at ow such a thin material can keep you so warm! Why We Liked It – These mittens are the best winter companion, they work like a charm even below freezing weather. They are a bit longer at the cuffs so that you can overlap them under your coat, this will keep all of your forearm warm and cozy, too. Outdoor Research definitely went a step further with these mittens and made them one of the best, quality skiing gloves on the market! Hestra has been on the market for a long time, and it’s easy to see why they are many people’s first choice when it comes to buying ski gloves. The customer gets to choose from five colors: black, cork, red, navy and white. They are made of 90% leather which is effectively the best material to use for gloves if you want to keep your hands warm for a long-time and not only one or two hours! These are perfect, heavy-duty ski gloves and are the best for anyone that wants to have fun out on the slopes for hours. They have a fleece lining on the inside that is very pleasant to the touch and the thermolite insulation will keep your fingers nice and toasty. The ski gloves are also waterproof and breathable, therefore if some major snowfall will appear in the mountains (or rain!) you can be sure you will be kept dry and warm. The hook and loop cuff will keep all of the snow out and will prevent it from entering under the cuffs and up your forearms, something that undoubtedly everyone hates! You will also be provided with Hestra handcuffs that will allow you to secure your ski gloves to your wrist. That way if they slide off or if you will temporarily need to take them off you will not have to worry about losing them. Why We Liked It – If you are looking for a pair of sturdy and comfy ski gloves, Hestra will give you all of that and more. They are the best brand to look up to if you want to feel comfy, the fleece liner will make sure that your hands will be cozy and warm while the outer layers will do their best to help keep you protected! If you don’t have hundreds of dollars to spend on simple ski gloves or if you simply refuse to give so much for a bit of fleece that will protect your palms, KINCO has got you covered with their ski gloves. You can usually catch them at fantastic prices, too, even if the original price is 30$, these can usually be found to be sold as low as 20$. That’s a great price for ski gloves that could cost twice or thrice as much and rival 80$ gloves on the market. You definitely get more for less here and it’s a great investment. You will be able to choose from 4 sizes: small, medium large and XL. These ski gloves have a comfy knit wrist that will help avoid you having any cold spots when you put these on to accompany your winter snowboarding jacket (click here for the full guide). The shirred elastic wrist will help avoid any snow falling inside of the glove, like is common with the typical, normal gloves you would wear. The back of the glove is covered in leather pig skin which is great for staying dry. The seamless wing thumb is a great addition to help to allow you to have more mobility when moving your hands. The double layered thermal lining will not disappoint you here and will repel cold and moisture better than any other glove. Why We Liked It – KINCO’s ski gloves are not only extremely affordable, but they have all of the features that other, even 80$ gloves have. This makes them a steal, even if it’s for back-up protection! The thermal lining and form fitting material will help you break-in these ski gloves within minutes and they are some the best on the market today. This Hestra mitten design is definitely one rarely seen out on the market. Instead of just having ski gloves that are advertised as mittens or as gloves, Hestra has made a pair of gloves that combines both. This 3-finger mitten pair of ski gloves is best for someone that wants to combine the all-around comfort and coziness that normal mittens offer with the mobility of normal gloves. These are available to be purchased in 9 colors: white, black, yellow, red, black, green and in three shades of brown. These mittens are praised all around with 5-star reviews. These ski mittens are insulated with fiberfill, which is an insulating fabric that is made from polyester fiber. The polyester lining is soft and cozy and will provide the utmost comfort. The outseam sewing technology here also helps your fingers feel comfy and undisturbed when out on the slopes, it’s easy to have mobility with these mittens and the cuff will overlap with your forearm easily to fit together with your winter jacket. This will in turn help keep you safe from any cold spots that other types of gloves are prone to, since not every brand includes cuffs with their ski gloves. Why We Liked It – Hester has once again supplied the market with a very efficient and durable pair of ski gloves that have a very original design. Many customers say that the wrist strap is very useful, that the ski gloves are very flexible and that the index finger being free gives a lot of mobility and comfort. Gordini’s storm trooper gloves are made from 94% nylon and 6% spandex which makes them one of the best candidates for repelling moisture and snow. The pre-curved construction helps greatly in improving the mobility of the hands, the seams are made to go around the design in a curved pattern to not hinder any movement. There is an index finger and thumb reinforcement, that is a perfect addition since those parts of the glove are often the most used, too. There are four color options to choose from here, too: black/tan, black, gun metal/black and legion blue/tan. Gordini has also provided everyone with very accurate sizing charts to make sure that no one ends up buying a pair of ski gloves that is either too small or too big, but just right. The gauntlet design can be easily dragged over the coat sleeves and are enforced at all the right spots where the usual wear and tear kicks in quickly. These are definitely the best gloves when it comes to endurance, some people report that they were able to use the same pair with the same great effect for 10 years! That is definitely an achievement int he ski glove market, and not a small one, either. Why We Liked It – Gordini’s gloves definitely have everything that good ski gloves should have. They have a special pocket in which you can put glove warmers in, which in itself is something incredibly rare, and the wrist straps will help you keep your gloves by your side at all times, even if you decide to take them off. These Hestra Heli gloves have a very modern and fashionable design, they are double-colored and the inside of the palm is a completely different color from the outside, which makes for an interesting pattern. You can get these gloves in three colors, black and white, red and white and gray and white. If you are looking to have a good-looking pair of ski gloves that you will be excited to put on each time you will be hitting the slopes, Hestra is definitely the best candidate here. 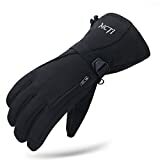 These ski gloves are made of 70% leather and 30% synthetic and have a removable polyester liner, which means you won’t have any trouble washing these gloves. You will be able to throw the liner into the wash without damaging the outer, protective layer of the gloves. If you grease the leather every night, the day before you go on the slopes each day, you will be able to keep these ski gloves for years. They will repel moisture better when they are oiled up and the wear and tear won’t be as severe. A polishing cloth is commonly used to oil these up, after this, the leather will be saturated with the substance you will be able to hit the slopes with no worries. The wrist leash here is very useful and the craftsmanship is one of the best. Why We Liked It – Hestra has provided the market with all types of ski gloves over the years, and this pair is definitely one to look at thoroughly if you are looking for a reliable pair of ski gloves to help keep your hands warm. With the gloves oiled up you will be able to have these gloves repel moisture for hours during your skiing adventures on the slopes. These mittens have one of the best, most attractive, most colorful designs out on the market. You can rest assured that you won’t be able to lose these mittens easily thanks to the bright colors. There are five designs to choose from: blue/pink, pink, black/blue, black/grey and black/yellow. They are really some of the best looking mittens out there and you will have no trouble spotting your relatives if they end up buying the same kind of mittens but with a different color scheme. One of the best features of these mittens is their ability to allow you to use your smartphone thanks to their advanced touchscreen capabilities. You can do this with both the exterior mittens and with the glove liners underneath. The zip pockets that are located on the back of the hands are big enough to fit your ski passes, keys, hand warmers etc. without reducing the flexibility of the gloves themselves. They are naturally waterproof and breathable and should any snow or water fall on the fabric it will slide right off thanks to the water repelling finish. These mittens are designed not only for skiing but for all kinds of winter sports, therefore if you like to be a bit more adventurous and have interest in other winter activities, these mittens should serve you well all around. The insulation here is light, thin and warm, you won’t feel any extra weight on your hands and they will be kept warm regardless. Why We Liked It – Furst’s ski mittens are perfect for anyone that wants to have warm and toasty fingers when the temperatures outside are below zero. These mittens are breathable, waterproof and very light-weight, all of these features ensure that you will only have the best skiing experience when you put them on. Black Diamond’s ski gloves are best for anyone that is looking for a durable pair of mittens that will protect from the cold and moisture reigning outside. They are 100% waterproof and they will be sure to keep you dry even during the heaviest of snowfalls. These mittens also have a removable velcro liner which is fantastic for those people who like to throw all of their dirty wash into washing machine instead of using sprays. The removable liner is also insulated which adds to the extra warmth insulation you will be getting when you will be out on the slopes. The gloves are made of 92% nylon which is also the perfect material to repel all the cold and moisture you will be encountering. They are light-weight and resist abrasion very well, therefore if you run into some sharp ice or snow you will be able to be worry-free knowing you’re safe. The large gauntlets will easily allow you to drag the mittens over your coat or jacket to help avoid any cold-sports. These are definitely the best mittens if you are looking for full protection, both from the cold, moisture and accidents. There are also straps where you can attach a lanyard so that you won’t have a chance to lose these. Why We Liked It – Black Diamond’s ski mittens are some of the best mittens on the market, they removable liner is perfect for when you want to take it out and let it dry quickly. The gauntlets are big enough to help cover your jacket and keep your forearms warm and cozy, too. The straps are also very helpful so that you can always have an eye on your mittens, wherever you are. Marmot’s ski mittens are made of 100% nylon, that means that you can safely throw them into the washing machine without worrying about them losing their strength. They are naturally waterproof, immediately repel water and snow and don’t have any bulk that could trouble you while skiing. After all, a tight grip is often needed and bulky winter wear doesn’t help and Marmot knows that.The wrist straps are well integrated into the design and look like they belong there, they will help you keep an eye on your gloves at all times. The gauntlet drawcord will make it easy to keep the snow out and to pull it across your jacket or coat. The reinforced palm design helps make this one of the best pairs of mittens; you will be able to put these mittens throw a lot of wear and tear before they will finally give out. Many people report that these mittens help eliminate numbness in the hands even at the lowest of temperatures.If you have poor circulation or need to spend time in states where temperatures drop below -40, Marmot makes the best and warmest gloves for the coldest of nights and days. + warmest gloves out there! Why We Liked It – While there are many mittens out there that are perfect for temperatures below zero, not many ski mittens are able to withstand a -40 temperature and still keep the person’s hands warm. Marmot however manages that splendidly and is the best brand to turn to if you are looking to keep yourself warm even in weather that is below freezing. These Black Diamond Solano gloves are a bit more expensive than the previous ski gloves we have listed, but nevertheless they are a fantastic investment and are some of the best looking ski gloves out there. The way the leather pattern is curved around the glove gives a very attractive, modern design that looks more like daily, fashionable gloves than skiing gloves. If you care about how you will look out on the slopes, this pair of mittens is definitely the best you can get. They are 100% breathable and waterproof and are made of goat leather that has two layers and a long gauntlet, this will ensure you can pull it over or under your jacket. Thanks to the LED button controls there are three different heat levels that you can control when you are out on the slopes. The waterproof zipped battery compartment ensures that the technology will be kept safe and dry no matter what happens. The battery compartment also has a rechargeable battery and the fleece lining is the best cozy material you could wish to have inside your gloves. You should definitely remember that glove sizes can run a little small, and it’s best to order a size one bigger than yours. Why We Liked It – The LED heat controls here are some of the best technology you could ask for, you will be able to choose from 3 different heat controls to have the ideal, perfect surrounding for your hands during your skiing adventures. The cuff is long and will keep your wrist warm and the rechargeable battery will make sure that you will be able to use these gloves for a long time to come. Many people don’t know how to wash their ski gear, since there is a lot of controversy surrounding the topic. It’s best to assume that there are no specific rules and that you should trust the brand you buy from and their opinion only! Usually there is a bullet-point description under each pair of ski gloves that states whether the liners are removable from the gloves and if they can be dried or washed alone, without the outer shell. Other types of gloves require more effective care, like sprays and the alike. There are many types of ski gloves out there: waterproof ski gloves, silk glove liners, leather ski gloves etc. and each and everyone one of these alternatives needs to be cleaned in a different way. A lot of people mistakenly think that you can throw a pair of ski gloves straight into the washing machine like you would do with your regular, woolen gloves. This couldn’t be further from the truth, since with some brands this could mean you would end up damaging the whole product. Most brands advise against throwing the full ski glove into the washing machine, since the detergents and pressure can damage the gloves and damage the waterproof layers and destroy all the insulation that could’ve been present upon purchase. The best thing you can do is to check if your new ski gloves have removable liners, if they do, that usually means you can take those out and put them in the washing machine or put them out to dry by themselves. This will reduce the odor and is very efficient, especially since our hands can sweat quite a lot when we are skiing and moving our arms relentlessly. Some gloves, like those made of polyester, can be thrown into the washing machine without any worries. Leather gloves usually need to have a much gentler approach, you will need to avoid dipping them fully into water. Instead, you should take a damp cloth and gently wipe away any dirt that is residing on the surface. There are many leather cleaners out there, even specifically for ski gloves, buying one of those and using it with your gloves should yield good results and reinforce the leather instead of damaging it. Upon spraying the bought substance onto the leather you should begin to gently rub it in and let it soak in through the night, like you would do with waterproof protective oil. Do not tumble dry or hang these gloves near any radiators or other heat sources! This could damage the material. After the leather has dried, apply a special waterproof wax or oil based substance made for ski gloves to help prevent the leather from cracking. Apply this only to the outside of the glove! It is recommended that you slip one of your hands into the glove that you will be waxing with your other hand to ensure you don’t miss any spots. This will help avoid any cracks in the leather later on. If you’ve never had to deal with washing or using winter gear before, it can be hard to know what to do with it when you’re done skiing for the day or season. Usually, people who are not experienced in taking care of their gloves, just take them off and leave them inside the house. This, unfortunately, isn’t very beneficial for the gloves themselves, since leaving them in a humid environment after wearing them for hours on the slopes can result in some nasty odors. If you have tried skiing you will know that it requires you to move your arms a lot and the grip hold and cozy, fleece liners can make your hands pretty sweaty. Just taking off the gloves and leaving them laying around will usually result in bad smells since you wouldn’t be encouraging the airflow, and the bacteria that gathers up during your skiing rides will stay within the gloves and spread. If you are looking for a few, sure fire ways to always keep your gloves fresh and nice, read on! First of all you need to determine if your gloves have a removable liner or not. If they do not, you should take them off after you finish your daily ski session, and then hang them outside to help the wind flow through them. When you are skiing, even if your gloves have a breathable outer shell, your hands are still clogging up must of the fleece and tiny vents. This will cause your hands to maybe sweat but that’s what keeps them warm, too. The trick is to take off the gloves each time after you come back from the slopes. This will let the mittens ventilate and your palm won’t be there to clog up the vents, thus resulting in a fresh glove after a few hours! If your mittens have a removable liner, you can remove it easily and spray it with a cleaning detergent to keep them even more fresh and clean. Alternatively, you can put them in luke warm water that can be mixed with gentle soaps or special cleaning oils. Do not wash the gloves in boiling or freezing water since that can stretch and shrink them easily. After that you can rinse them with cold water and vinegar to help remove all of the soap remains. After the wash you can hang them out just like before, out in the open, or place them on a towel. This will help the wind naturally dry them and it won’t damage any of the layers or protective insulation shells. It’s best to always have a back-up pair of gloves on your travels so that you can alternate between the two. Some can take longer to dry than others and some aren’t waterproof. Either way, you should definitely avoid placing your gloves over fires, radiators, under hair dryers and the alike. Some hotels and ski resorts have special pipes that are heated up to body-temperature where you can place your gloves and ski boots– this helps tremendously if your gloves are still wet the next day and if you want a quick, safe solution that won’t be shrinking your gloves! If you have ever been out on the slopes, it’s easy to see a stray and lonely ski glove here and there. Many people tend to leave them laying outside by accident since losing them is so common. It’s easy to pack them into the front of your coat and forget that they are there. Since mittens are usually more bulky they can fall out of the pockets without you even noticing, and that is usually the problem. That’s why many people end up looking for gloves that have weaved in security cords- they are extremely useful to have. For example, when you are on a ski lift and you need or want to take off your gloves you can do so without worrying. Your gloves won’t be falling down miles under the ski lift right into oblivion and won’t remain forgotten and impossible to find. Some people like to go out and make DIY cords since many gloves don’t come with cords anymore. Some people find them too fiddly and too frustrating to deal with, but if you set them up correctly they should give you no trouble at all. Usually, you will have to clip the cord to the glove and then tighten the elastic loop located on the other side. This will ensure that you will never lose your gloves and that you will be able to take them off easily, without any worry, to do side activities. Like checking your phone, grabbing your food, putting on your boots or taking a new skiing pass. Whether you will be making your own DIY glove cord or if you will be buying mittens that already have one, the trick is to safely put the elastic loop over your cuff and tighten it accordingly with the slider while clipping the pin to the gloves themselves. Many people state that this cord has saved their gloves many times, especially when you are sitting around on the ski lift and fiddling around waiting to arrive at your desired slope! It’s truly one of the most useful accessories you can purchase a pair of gloves with, especially if you have kids or friends that are known to forget or lose their gear around the resort, this simple invention can save a lot of headaches. There are many viable places online where you can buy good, solid ski gloves. Most people nowadays turn to the internet to do their winter shopping not only because it’s convenient, but because the amount of options that you are presented with are simply overwhelming. Whether you are going on a family trip or a friend meet-up, you can save a lot of money when buying bundles, too. There are many great places online to look at if you are searching for a new pair of mittens for yourself or for your loved ones. AMAZON.COM is possibly the best known website for online-shopping, and rightfully so. You can list the ski gloves in various categories, from sizes, to prices, to availability etc. Amazon also offers default rank lists of the most often purchased gloves. For example, if you are looking for the most popular ski gloves purchased by customers, you will get a list of the Top 100 gloves in that category and the task of choosing one specific pair of gloves will be made way easier. Each pair of ski gloves comes with a description about the pair of gloves and the company that made them and gives data about the material they are made from, how they can be washed, what key features they have etc. all of this is also backed up by dozens of customer reviews that can be sorted by stars. This way you get the positive and negative opinions on one page. Another great website for purchasing ski gloves and all around winter gear it EVO.COM. They allow you to tick a vast variety of categories that can help you narrow down what you want to the bare necessities. If you are a fussy customer or have fussy family members that want to save some time when looking for new ski gloves, this is definitely the website to go to. You can choose the gender you are looking for when purchasing, the brand, the sizes, the colors, prices, materials and there is even an option to choose how warm you want them to keep you from. From warm, warmer to warmest. EVO.COM is definitely one of the best websites for a customized purchase. There are also options to check where the mittens are available, which state they are able to be sent to, and even where they can be shipped to, if you are looking at international purchases. No matter which website you will end up buying from, one thing is sure: you need to take a good long look at the size charts and the reviews! Some ski gloves can come very big or very small depending on the size charts and how your hands fit into them. It’s best to thoroughly read everyone’s opinions and see what they had to say about the gloves they purchased, a common rule is to buy a pair that is at least a size bigger than your hand to allow room for your fingers to move, but every brand has a different way to saw seams and the thickness of the fleece and shell material also varies greatly! You have no doubt encountered both gloves and mittens already during your search for the best winter companion to keep your hands warm! The two do not differ too much from each other, and can even be combined in some cases. Mittens usually have one full pocket for all of the main fingers of the hand (from the pinky to the pointing finger) and there is a separate pocket for the thumb. This kind of design can help keep your main fingers warm and toasty since the can share the heat. With normal gloves, you usually have a slot for each finger, which may be troublesome for people with poor circulation, since the fingers aren’t bundled up together and need to use their own energy to keep warm in their own slots. Normal gloves may also make it harder for you to move your fingers after gripping your sticks for a long while. With mittens, the fingers will have a lot of freedom thanks to the main pocket they will be residing in. If you are looking to be able to have more control over your hands, normal ski gloves should be your go-to option since they are the best for people who need a bit more control over their kits and surroundings. Some people may feel constrained with just having mittens on. If you find that your hands go blue quickly with normal gloves and you need a bit more bundled up heat, mittens should be your go-to choice, since they will keep all your fingers together, even if that will restrain your movements a bit. There are also ski gloves that have a mitten overlay, so that you can have two options for the price of one! If you can’t decide between the top, the best option is to go for the brands that offer the dual-solution.Whichever option you will end up choosing, you will surely be kept warm during all of your future winter skiing adventures, since each brand we listed does their best to give your hands the best care! Our Top Choice spot has to go to Outdoor Research’s gloves! They have all of the features packed together into one, coherent pair of gloves that will keep your hands cozy and safe from the gnarly cold. Even though the material these gloves are made of is very thin it does its job perfectly. People have reported that even when they use the gloves below zero temperatures, their hands are still kept warm and toasty. By no means does that mean that your hands will get sweaty, since the material is breathable enough just to let a bit of airflow through to evaporate the unneeded heat, giving you the best optimized gloves you could ask for. The craftsmanship here is also something special, the seams are very well sewn and present themselves in their best light. The red color of the glove has proven to be useful for many customers since if they drop the glove it’s very easy to find. The over-mitt is a great addition and the fact that you can always take it off to do glove-based chores is fantastic. If you want to stay dry and start having fun with your skiing adventures, these are definitely the best gloves for you. Outdoor Research’s gloves has made it as our Top Choice thanks to all of the vital features that they included with these gloves. It’s one of the best optimized sets of gloves for harsh, winter conditions! Our Premium Choice spot has to go to Hestra’s outdoor ski gloves! They do not only keep you warm and toasty thanks to the inner fleece liner and insulating leather, but they also protect you from any scrapes and bumps that you might run into when being a bit more aggressive with your skiing. The stitching is said to be perfect and of quality that can without a doubt last for many year. The cuffs mesh nicely with winter jackets and will help cover and avoid any possible cold spots. The ski gloves also come with a bit of Hestra leather balm, and if you end up liking the effects that it has on your gloves there is a whole tin available for purchase. The padding here is fantastic and many customers recommend that you use the conditioning balm the first time around, it increases the suppleness of the leather and will help you have an easier time breaking into the gloves, since leather can be a bit tough to flex at first. The balm also increases the waterproofing and the handcuff element will ensure that you will never lose these. Thanks to all of these features that Hestra provides with their ski gloves, they are definitely our first candidate for the Premium Choice! The craftsmanship here is fantastic and the fabric and material is some of the best. Our Great Value choice has to go to KINCO’s ski gloves! Not only do they have features of ski gloves that can cost thrice as much as they do, they are not a simple, cheap alternative, either. They hold their own and have their own specific features, and that makes them a worthy contestant on our list. They have a wide range of sizes to choose from and they are made of pig skin leather which is known to withstand all kinds of exposure to moisture and cold, both of which are easily repelled. During the purchase of these gloves KINCO will also gift you waterproofing wax for the pig skin leather to help keep your hands extra dry. Leather pigskin is known to be very durable and tough, as well as breathable and very flexible. This will ensure that you are able to easily move your hands within the glove while still keeping them protected. For the study on how gloves protect you from extreme weather click here. The leather will not stiffen your movements which is common in other leather-made ski gloves out on the market. Thanks to all of these features we have to give KINCO’s ski gloves our spot as the Great Value gloves for skiing. Pricing in at 30$ this is definitely one of the best deals you can get out on the market today, and if you feel like you need a new pair of ski gloves, this should definitely be your pick! Choosing the right ski gloves can be a daunting task, especially since you can never be sure how they will react when they are exposed to the cold. It all depends on the weather; some ski gloves may work well during drier conditions with mild temperatures, while others can withstand enormous amounts of moisture and cold being thrown at them, even with the temperatures reaching below zero. We hope that our reviews and answers to the commonly asked questions were helpful and prove to be useful in choosing a good, durable, waterproof and breathable pair of ski gloves that will flawlessly assist you with your skiing adventures.